FILE - Students pray at Ar-Raudhatul Hasanah Islamic boarding school on the first day of Ramadan in Medan, North Sumatra, Indonesia June 6, 2016. When Ulil Abshar-Abdalla was a teenager in Pati, Central Java, he placed first in an Arabic class held at his local madrasa. The prize was six months of tuition at the Institute for the Study of Islam and Arabic (LIPIA), a Jakarta university founded and funded by the Saudi Arabian government. At the end of six months, LIPIA offered him another six. He stayed on. After that, it offered him four more years of free tuition to obtain a bachelor’s degree in Islamic law, or shariah. He accepted that too. In 1993, after five years at LIPIA, he was offered a scholarship to continue his studies in Riyadh. He finally said no. FILE - Students pray during the first day of the holy month of Ramadan at Al-Mukmin Islamic boarding school in Solo, in Indonesia's Central Java province, August 1, 2011. Since 1980, Saudi Arabia has been using education to quietly spread Salafism, its brand of puritanical Islam, in Indonesia, the world's most populous Muslim nation. The two main arms of this effort are LIPIA and scholarships for higher education in Saudi Arabia. Salafism is an ultra-conservative reform movement that advocates a return to Koranic times. LIPIA teaches Wahhabi Madhab, a strain of Salafi Islam expounded by the medieval Sunni theologian Ibn Taimiyah. “Saudi alumni” are now visible in many arenas of Indonesian public life, holding positions in Muhammadiyah, the Prosperous Justice Party, and the Cabinet. Some have also become preachers and religious teachers, spreading Salafism across the archipelago. The effects of Saudi Arabia’s massive soft power exercise on the Indonesian citizenry are just starting to become clear. The nexus of Saudi educational diplomacy is the religious attaché, a special office affiliated with its embassy in Jakarta. The office grants scholarships for students to study in Saudi Arabia, although the current attaché, Saad Namase, refused to confirm how many students were involved. “We don’t really work with the Indonesian government,” said Namase. “We just try to strengthen cultural ties between our two countries by, for example, holding Quranic recitation competitions.” On the topic of scholarships, he said many countries, including the Netherlands and the U.S. offer scholarships to Indonesian students and the Saudi program was just one among many. FILE - A teacher gestures during an Islam personality class during the holy month of Ramadan at the Al-Mukmin Islamic boarding school in Solo, Indonesia Central Java province, Aug. 2, 2011. The attaché’s office also pays the salary of prominent Salafi preachers and supplies Arabic teachers to boarding schools across Indonesia, according to Din Wahid, an expert on Indonesia Salafism at the Syarif Hidayatullah State Islamic University in Jakarta. Beyond the attaché’s office, several Saudi Arabian universities directly offer scholarships to Indonesian students. One reason the Indonesian government is unlikely to present roadblocks to Saudi cultural expansion is its precarious annual Hajj quota, according to Dadi Darmadi, a UIN researcher who focuses on the annual pilgrimage to Mecca. FILE - Indonesian Haj pilgrims walk towards their flight at the airport in Solo, Central Java province, Indonesia, Sept. 17, 2015, in this photo taken by Antara Foto. Hidayat Nur Wahid, a member of Indonesia’s House of Representatives and a leader of the right-wing Prosperous Justice Party (PKS), is one of the most prominent national politicians who have passed through Saudi universities. He studied, through a series of scholarships, for an undergraduate, master’s and doctorate degree in theology and history of Islamic thought at the Islamic University of Medina. 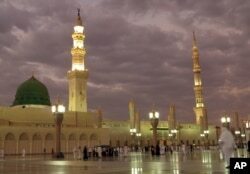 FILE -- In this July 5, 2013 file photo, worshipers visit the Prophet's Mosque in Medina, Saudi Arabia. “Since it is the place where Islam originated, many students think that Saudi Arabia represents authentic Islam,” researcher Din Wahid. Saudi theology had the opposite effect on Abshar-Abdalla, who gradually grew disenchanted with the Salafi movement during his five years at LIPIA. “Although I had some short-lived enthusiasm for that simplistic theology, I found it to be puritanical at its core,” said Abshar-Abdalla. Instead, he started to read various other Islamic texts on his own, including Sufi and Shia ones, and eventually founded the Liberal Islam Network (JIL) in 2001. Although Saudi-educated preachers in Indonesia might be causing a subtle rightward shift in national ideology, a more immediate concern is whether Salafi teachings encourage terrorism or extremism. One prominent example of non-quietist, or jihadist, ideology is the Salafi-influenced Ngruki pesantren in Solo, Central Java, which has incubated a number of known Indonesian terrorists. And Zaitun Rasmin, a graduate of Medina Islamic University, was one of the chief organizers of the hardline demonstrations against the governor of Jakarta in late 2016. “He’s an example of an Indonesian Salafist who is unconcerned with being ‘apolitical,’” said Wahid.